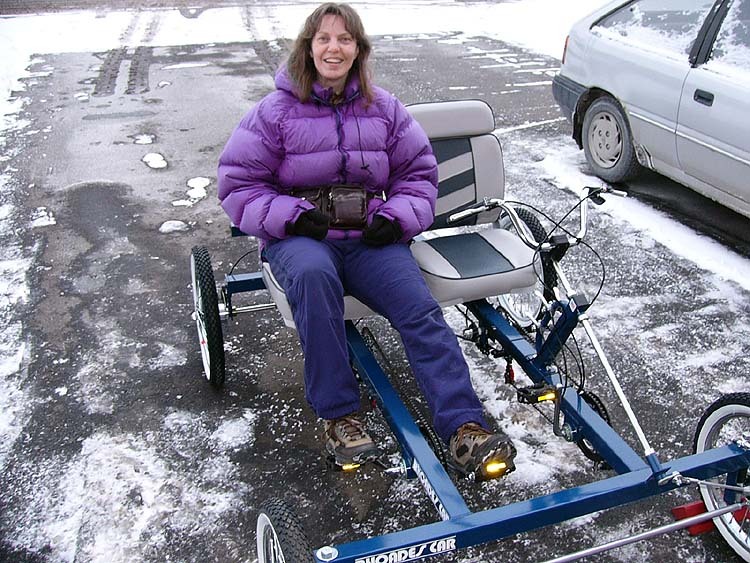 On 29 November 2006 I ordered our quadracycle from Rhoades Car of Tennessee. 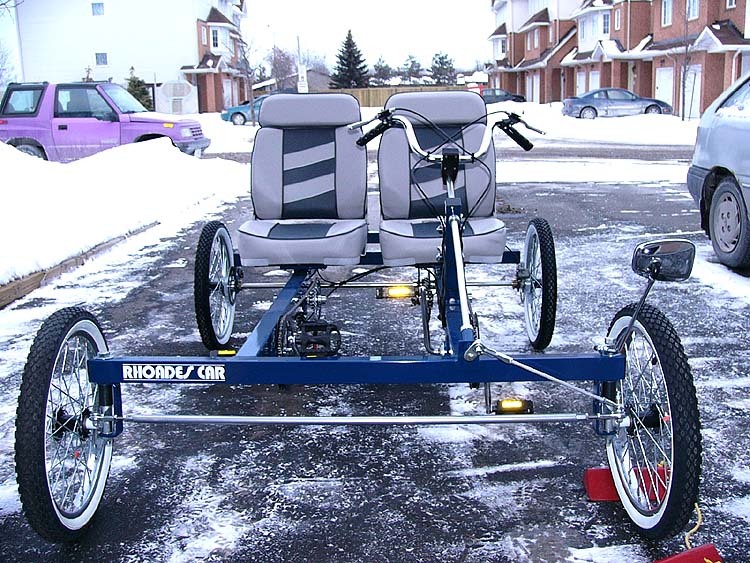 It was delivered on 08 February 2007 , in lots of time for the spring cycling season here in Ottawa, Ontario. 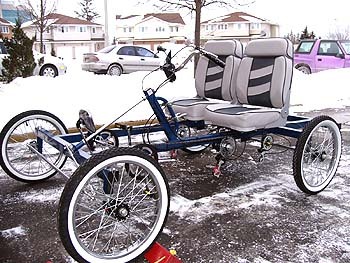 At that time Rhoades made touring quadracycles in single seat, two seat and four seat models, plus a line of industrial-use quadracycles called "Go Boy", as well. My quadracycle is a Rhoades 4W2PCP. This designation translates to "Four wheels, Two People, Coupe". 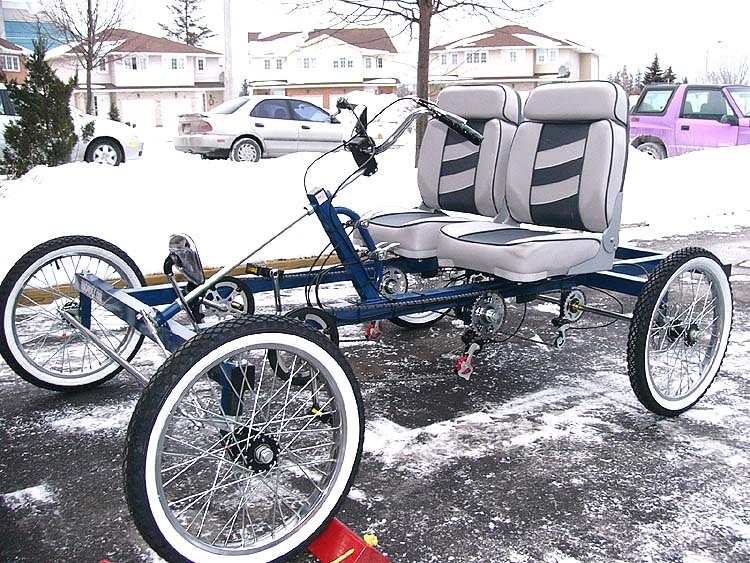 Both seats are independently adjustable fore-and-aft and both sets of pedals work independently, meaning both can be in different gears or one person can stop pedaling and coast if they like. Here is a quick run down on the specs for my quadracycle, measured by me. Chain size 1/2" X 3/32"
Crew height range (with two range holes) approx 5'7" to 6'8"
It is possible to add most of these options later, but I haven't found that I have needed them. Myr aim was to keep the vehicle as light and as simple as possible. I have more information and pictures of my quadracycle in our quadracycling on-line diary and also in my photo gallery.